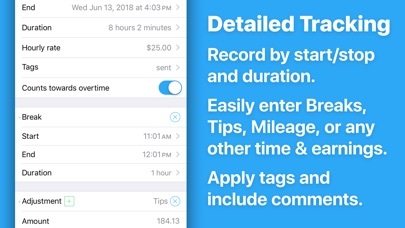 QUICK AND EASY time entry and editing make time tracking painless • Record time using timers, complete with support for Breaks and Pauses, including automatic breaks • Track your pay, including Tips, Mileage, and flexible ± time and earnings adjustments • Pick any time to start, stop, break or pause the timer (7 minutes ago, 10 minutes from now, whatever you need) • Set job locations and get clock in and out reminders when you arrive or leave or fully automate your time tracking (geofencing) • Manually enter time entries with minimal effort thanks to smart, adaptive defaults • Enter comments of any length with your time entries and optionally include them in your exports • Control timers, dictate comments, and apply tags using your Apple Watch ADVANCED FEATURES and customization set HoursTracker above the rest • Automatic daily and weekly overtime earnings calculations • Built-in reports by Day, Week, and Month and support for most common pay period schedules • Robust tagging and filtering allow you to build your own custom views • Reminders when you've worked your target number of hours per day (even takes time rounding into account) • Automatic time rounding: up, down, or to nearest (including 6 min) • Easily copy an existing job or time entry to save time and effort • Reminders you to clock in on your selected work days • Today Widget for at a glance time and pay monitoring • CSV and formatted text export via e-mail or the iOS Share Sheet • Passcode lock (with Touch ID support) helps keep your HoursTracker data private • Cloud-based backup/restore with one re-usable backup slot included free (free account sign up is required) • Web-based reporting access, including charts, graphs, desktop exports, and rolling backups available with optional subscription • Customize your HoursTracker experience in the Preferences section under the More tab. 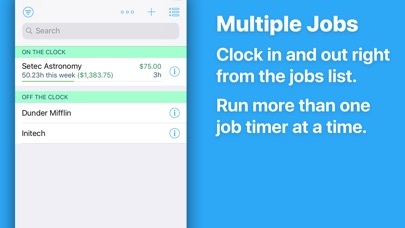 Choose only one or many jobs clocked in at a time, opt-into prompts for comments, choose an elapsed time format (hours:minutes, or decimal hours), and more "Free Edition" stores up to 3 jobs and 21 days of entries. 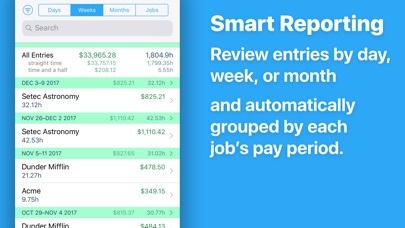 For unlimited entries, upgrade to the "Personal" (up to 5 jobs) or "Pro" (unlimited jobs) edition. Or, erase older data and continue to use the "Free Edition" until you're ready to buy. 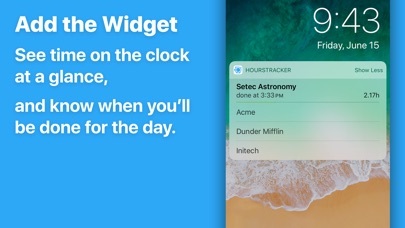 Visit our website at http://www.hourstrackerapp.com to learn more, and follow @HoursTracker on Twitter or facebook.com/HoursTracker to hear about upcoming features first. App Store reviews help users find the best apps, but they don't allow us to help you because we cannot respond. If you have a question, problem, or need help, please send us a support request via e-mail. How do you get it to stop rounding the money amounts? I used it for 21 Days and they wanted me to pap $6 for it. Now I have to delete old clocks in order to use it. Does not sync across devices. 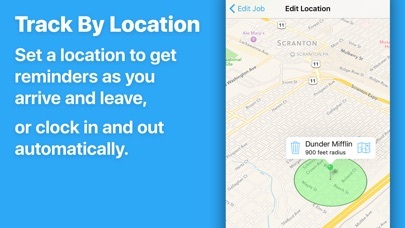 All other features are useful and seem to be reliable, but it is crucial that this app sync across all of my Apple devices. Great app. Though I hope in future updates to the app they include a month view so you’d be able to see the days in which you have logged in hours for in an easier format. This would be perfect if you could add gas mileage and attach receipts. Or even if you could add miscellaneous expenses as line items manually. I’m going to keep searching for the holy grail but I’ll use this in the meantime. So far I have used it for a little over a week and it seems to work ok. But so don’t like home the only way to export the data is to email it. I think it should give several different options. As I never received my email of the export. 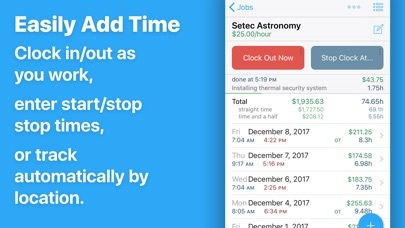 This app has helped me since I used to be working crazy unset hours but now I’m set but I like to see how much I’m making a day, and wish it would include some more info of how things work. Also include graveyard shift kind of rate and Sunday premium as well for jobs that do offer that. But anything else works awesome! So far this app has been really stellar. I’ve just estimated my hours for client work and learned that I’ve very much underestimated how much time I put in. It’s great to truly understand the time I’m providing and billing accurately. 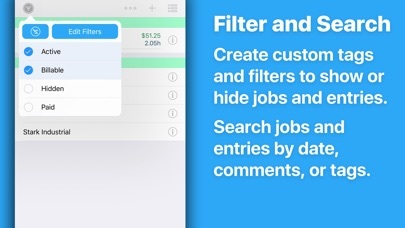 The feature I’d like to see is a job archive feature. 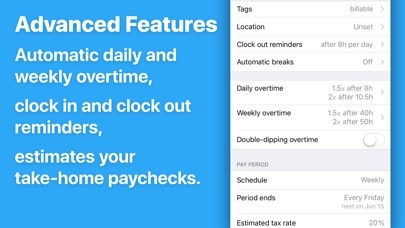 I’ve completed some client jobs, but I don’t want to outright delete the record of my hours, just in case I’d like to refer to them in the future. Is there a way to simply archive them and potentially pull them up later? If not, adding that feature would be amazing.